The Moth Theatre is proud to present Geography of a Horse Dreamer by Sam Shepard, directed by Jamie Wollrab. Geography … opens on Friday, January 29 and will run through March 6 only. Geography of a Horse Dreamer tells the story of a dislocated Westerner with a special talent, who finds himself in a bizarre situation. Cody, who hails from Wyoming, dreams the winners of horse races. He has been kidnapped, hidden away, and used by nefarious people bent on exploiting his rare gift to make millions. When his gift begins to fade, his life hangs in the balance. The cast will feature several familiar faces from the silver screen (in alphabetical order): Max Barsness (The Frankenstein Brothers), Thurn Hoffman (Crazy in Alabama), Kris Lemche (Final Destination 3), Patrick Lewis (Zodiac), John Markland (Fault Line), Scoot McNairy (Search for a Midnight Kiss), and Dov Tiefenbach (Sympathy for Delicious). The design team includes set by Kathleen Heffernan, lighting by Bosco Flanigan, sound by Patrick Janssen, and costumes by Louise Munson. The stage manager is Julanne Jacobs and the producer for the Moth Theatre is Genevieve Howell. Beginning on Friday, January 29, Geography of a Horse Dreamer will play two performances each weekend on Friday and Saturday nights at 8:00. THE MEDIA IS ENCOURAGED TO ATTEND THE OPENING NIGHT PERFORMANCE ON JANUARY 29, BUT IS ALSO WELCOME AT ANY OTHER PERFORMANCE. The six-week only engagement will end on Saturday, March 6. Performances will take place at the Moth Theatre, located at 4359 Melrose Avenue in Los Angeles, 90029. Tickets are $15 ($12 for students, seniors, and union members) and may be purchased by visiting www.brownpapertickets.com or by calling 323-666-2296. More info is available at www.moththeatre.com. Jacob Young, Ricky Paull Goldin, Adam Mayfield; The Guiding Light’s Robert Newman; plus David Hedison and General Hospital and Broadway star Constance Towers. Soap Fan Mystery Theatre kicks off with a new series of staged readings featuring Hollywood favorites, the most popular stars of daytime television, and rarely performed Agatha Christie mysteries at The Writers Guild Theater in Beverly Hills, located at 135 S. Doheny Drive (at Wilshire Boulevard). First up is Agatha Christie’s The Unexpected Guest, with three performances on Saturday, February 20 (8pm) and Sunday, February 21 (2pm and 7 pm). Stage and screen favorite Stefanie Powers, TV’s iconic Jennifer Hart, stars in Agatha Christie’s exciting thriller The Unexpected Guest with a trio of stars from ABC’s All My Children: Vincent Irizarry, this year’s Daytime Emmy Award-winner for Outstanding Supporting Actor (AMC’s Dr. David Hayward), Daytime Emmy winner Jacob Young (AMC’s JR Chandler), and Adam Mayfield (AMC’s Scott Chandler). After 40 years of taping in New York City, All My Children has recently moved production to Los Angeles. This is the first time the stars of All My Children will appear together on stage in Southern California. The role of the police inspector will be read by Robert Newman, who starred as Joshua Lewis for 28 years on The Guiding Light and recently finished a long run in the off-Broadway musical Sessions. David Hedison, perhaps best known for for his role on television’s Voyage to the Bottom of the Sea, also has appeared on Another World and The Young and the Restless. Broadway star Constance Towers (General Hospital’s infamous villain Helena Cassadine) brings her talents to the stage to round out the all-star cast. The second reading in the series, Agatha Christie’s Spider’s Web, will be performed Saturday March 13 (8pm) and Sunday March 14 (2pm and 7pm) and will star legendary actress Juliet Mills, along with her husband Maxwell Caulfield. Juliet is a member of the Mills family acting dynasty, alongside her father Sir John Mills and sister Hayley Mills. Juliet is a two-time Golden Globe nominee and Emmy Award-winner. Her most recent Emmy nomination was for her long-time role of Tabitha in the daytime drama Passions. Maxwell has appeared on Broadway in An Inspector Calls, numerous off-Broadway plays, national tours, and Chicago in London’s West End. He is well known as Miles Colby in Dynasty, and starred opposite Michelle Pfeiffer in the cult favorite movie musical Grease 2. 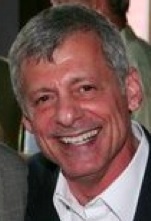 Another Grease alumnus, Ricky Paull Goldin (All My Children), who played Danny Zuko on Broadway in 726 performances of the long-running revival, stars as the Police Inspector investigating murder and mayhem at a country estate with Agatha Christie’s colorful suspects played again by Jacob Young, Adam Mayfield and additional mystery guest stars to be announced. Agatha Christie is the most widely published author of all time. Only the Bible has outsold her collective book sales of over four billion copies. Her stage play The Mousetrap is still running in London’s West End after 57 continuous years. This series of plays is being produced by HOO R US Productions, a partnership between Jacob Young and Mark Rozzano. Mark was an associate producer of Disney’s Beauty and the Beast on Broadway, which after a 13-year run is now the seventh longest running show in Broadway history. Mark and Jacob first worked together when Jacob made his Broadway debut as the loveable candlestick Lumiere singing “Be Our Guest” at night while starring on All My Children during the day. Reserved seating is $49.50. A limited number of $150 VIP tickets will be sold for each performance, which include premium seating, a post-show meet and greet, and a photo opportunity with the stars. Two-show subscriptions and group discounts are also available. Free parking is provided for all performances. 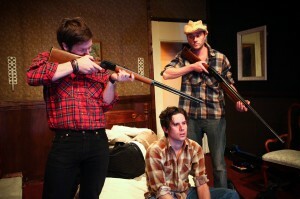 Tickets may be purchased online at www.tix.com or www.soapfanmysterytheatre.com, or by phone at (800) 595-4849. Free parking is available for these events. FOR INTERVIEW REQUESTS AND/OR TO ARRANGE PRESS TICKETS TO ANY PERFORMANCE, CONTACT KEN WERTHER AT kenwerther@sbcglobal.net or (323) 845-9781. In response to the devastating events in Haiti over the last 10 days, Pasadena Playhouse has announced a one-night-only benefit concert in support of three relief funds: Save the Children, UNICEF, and the Clinton Bush Haiti Relief Fund. Many performers from past and present Playhouse productions, along with other special guests, will donate their time and talents for this urgent cause. They include (in alphabetical order) Erica Ash, James Barbour, Shoshana Bean, Billy Blanks, Jr., Sharon Catherine Blanks, Doug Carpenter, Yvette Cason, Loretta Devine, Michelle Duffy, Geno Henderson, Adam Irizarry, Paulette Ivory, Crystal Starr Knighton, Sharon Lawrence, Ethan LePhong, Dawnn Lewis, Allan Louis, Shannon Stoeke, Angela Teek, Shannon Warne, and Harrison White. All appearances are subject to availability. The evening, which is being produced by Patty Onagan and Ronn Goswick, will be directed by Iona Morris, with Gerald Sternbach serving as musical director. There will also be a pre-show raffle, with items donated by theatres and businesses all over Southern California. 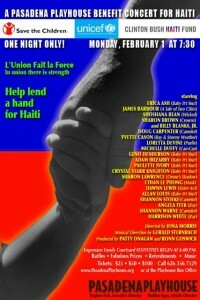 Tickets for A Pasadena Playhouse Benefit Concert for Haiti are priced at $25, $50, and $100, and may be purchased by calling (626) 356-7529, by visiting www.PasadenaPlayhouse.org, or in person at the Playhouse box office, located at 39 S. El Molino Avenue in Pasadena.